"Celebrate Classical Music: Why classical music is so fulfilling for me." Though I love many forms of music -- and most of us do -- classical music tends to have a special place in the heart of a violinist, violist or cellist. Classical challenges us, technically, emotionally and musically. It is the kind of music that grows with us, addresses so many emotions and experiences, and even changes meaning for us as we live our lives. And by classical, I simply mean in that tradition, which also includes Baroque, Classical, Romantic, Modern, etc. I'd like this to be a celebration of classical music, broadly defined. You can write about why it is fulfilling to study this music, to perform it, or to play in an orchestra that performs classical music. You can write about your journey with one particular piece, or your feelings about one particular composer. You can write about how classical music has inspired you in playing music of another genre, or how it has inspired you to write new music. You could write about an experience where classical music brought people together for something bigger. You can write about any other angle that says why you find it fulfilling! Here is someone who takes great joy in classical music! 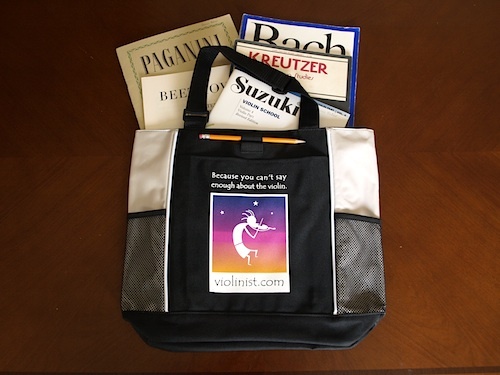 I will choose a winner from every blog entered, and that winner will be awarded a brand-new Violinist.com tote bag in early September, just in time for fall! Meanwhile, we can all enjoy each other's thoughts and insights on this subject. To enter: Simply post a blog on Violinist.com, under the title, "Celebrate Classical Music." I will keep track of these and make them easy to find for all of us. (If you have never posted a blog on Violinist.com, this page should get you started. If you need further help, please e-mail me.) You can post the essay/blog at any time during the month of August: an hour from now, or at 11 p.m. on August 31. There is no minimum or maximum length for your blog, just do your best to share your most genuine feelings about the matter. I will announce the winner on September 4, with an essay of my own. Violinist.com music bags! They will officially go on sale in September. 1. How much are planning to sell it for? 2. Are all those book included?!!! 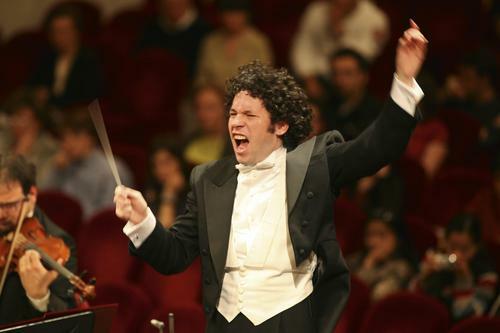 It's kind of interesting that a lot of conductors have wild hair that flails around while they work. I used to have a cat that was black with a little white on him -- he looked like he was wearing a tuxedo with spats. I was able to hold his arms up and wiggle him around (gently of course) in a manner that made me think of Seiji Ozawa. I don't have time to write a florid, shamelessly romantic ode to classical music for my blog. I'd say simply that I'm drawn to music for many of the same reasons I'm drawn to chemistry. There is a sense that one is in a world with endless depth, complexity, and wonder. And yet there are patterns, trends, a historical context, and a rigorous theoretical framework overlaying that complex world with a profound sense of order and purpose. No need to write anything florid or shamelessly romantic. It can be three sentences; it can be a picture with a caption, it can be a limerick or a Haiku, it can be humorous or serious. You can post a video, if you like. Be creative! It just needs to be genuine, that's the only requirement! Classical Music for me is fulfilling on a spiritual level. It not only communicates a message, but also the intention behind what we do, which always seems to get across to most of the audience. It allows me to face myself, my strenghts and my weaknesses and tweak how and why I do things as I keep going through the journey of this life. The violin can challenging technically, musically, physically, mentally, but on the level of the spirit, all of these are easy. Music is spirit and spirit is music. It is a way for all of us in a moment and space to become one. Nothing can be more special than that!